Can anyone tell me how to import AVI files to iPad or can iPad play AVI videos? Why most of my AVI videos won't be playable on iPad? Perhaps a majority of people have such kind of puzzle when they try to play AVI on iPad. In fact, iPad only supports AVI files that are compatible with the Mothion JPEG standards. Thus, if your AVI files are encoded with DivX, XviD, WMV and more, you can't play them on iPad successfully. There are two ways below to teach you how to easily play .avi file on iPad Pro/Air/Mini. As is known to all, iPad can't play .avi files encoded with DivX, XviD, WMV, etc directly. Hence, to smoothly play AVI files on iPad, the simplest solution is converting AVI videos to iPad supported video/audio formats (MOV, MP4, M4V, AAC,MP3, etc) and then import AVI to iPad for playback AVI on iPad. Later, the converted AVI file can be painlessly played on iPad Pro/Air/Mini or even iPhone and Mac. Serving as one of the best AVI video converter for Mac/Win, MacX Video Converter Pro provides users the easiest way to convert AVI to iPad supported video/audio formats like MP4, MOV, M4V, MP3, AAC and more with world's No.1 fast speed and original quality reserved. Besides, it also can convert other iPad unsupported video/audio formats like MKV, MTS, AVCHD, FLV, WMV, etc to iPad Pro/Air/Mini for replaying with ease. What's more, this AVI converter also can help you to free download videos, movies, TV shows, music from 300+ online sites (YouTube, Dailymotion, Facebook, Vimeo, etc) in 720P/1080P, 4K/8K UHD, AVI, MP4, MKV and so on. Now download this AVI video conversion app to make AVI video playable on any iPad. Before playing AVI on iPad, you should download this AVI video converter on your macOS (macOS Sierra/High Sierra included) to convert AVI to MP4, MOV, etc; please download Windows version (Win 10 supported) if necessary. Step 1: Open up this AVI video converter for Mac/Win on your computer and click "+ Video" button to load AVI video file that you want to convert. Alternatively, you can simply drag and drop your AVI file to this AVI to iPad converter. Step 2: Select an output format for your desired video file from the format list. Beyond question, you can choose MP4, MOV, M4V or even iPad Pro, iPad Air 2, iPad Mini 4, New iPad and more as the output format. BTW, this AVI converter Mac/Win also offers users many customized features to improve the watching experience, for example, compress AVI with no quality loss, clip video, crop frame size to remove the black bars, add downloaded subtitles, etc. Step 3: Specify an output folder on your computer to save the converted AVI files and then hit the "RUN" button to start to convert AVI to MP4 Mac/Win. Warm note: this guide can be also applied to play AVI on iPhone, Play AVI on MacBook, play AVI on Mac, etc. After conversion, in order to play AVI on iPad, you should transfer video to iPad device through iTunes or professional iPad video transfer. If you use iTunes to transfer the converted AVI files to iTunes, you can start iTunes -> choose file -> add file to library -> sync the converted AVI files to iPad. If you use the reliable iPad video transfer like MacX MediaTrans, you can connect iPad to Mac with a USB cable -> click "video" icon -> hit "Add Video" button to import the converted AVI file -> press "Sync" button. Warm note: the aforementioned two ways both are efficient such that you can choose one according to your requirements. It is worth mentioning that the professional iPad video transfer is able to automatically detect and convert your AVI videos to iPad supported formats in the process of transferring. That is to say, you needn't convert .avi to iPad at first and you can directly transfer AVI to iPad with MacX MediaTrans. Many users believe the conversion process is pretty complex and began to figure out another way to play AVI on iPad without converting. As a matter of fact, you can depend on iPad video player for non-conversion playback. Fortunately, there are some iPad video players on the market available to play AVI on iPad. Next, we list top three iPad video players for you to effortlessly play .avi files on iPad Mini/Pro/Air. VLC is a free and open source multimedia player which can be used to play all kinds of format videos on iPad including AVI, MKV, MPG, MP4, DIVX, WMV, MOV and more. This all-in-one video player is ease to use, powerful, 100% free and clean. But sometimes you may come across VLC not working issues. Especially designed for both iPhone and iPad users, PlayerXtreme Media Player supports HD playback in 1080P for all formats (3gp, avi, divx, flv, m2p, m2ts, m2v, m4v, mkv, etc) so that playing AVI on iPad is a piece of cake and you can freely watch avi files on iPad. And it is also able to play the files from your email attachments and support multiple audio tracks in a file. KMPlayer is a free encoding player that plays almost all kinds of video files like VCD, DVD, AVI, MKV, Ogg, OGM, 3GP and more on iPad. And this AVI player for iPad also can easily deal with various audio and subtitle formats and allows users to capture audio, video and screenshots. KMPlayer Mobile App was released on 15 March 2014 and it is available for Android and iOS devices. Feel free to download for the sake of playing AVI on iPad. Can't play AVI on iPad? 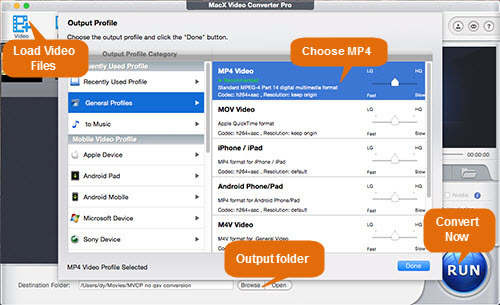 Download the world's fastest AVI video converter - MacX Video Converter Pro to effortlessly convert AVI to iPad MP4, MOV, M4V and more for playback with ease. Original quality reserved and no quality loss. No virus, spam, etc.